When it comes to treating edema leg swelling and constipation, the winter melon diet is fit for the job. Health benefits with less than half the calories. The winter melon diet gives you added nutrition you need to succeed in your diet while being low in calories. The healthy benefits of this exotic food often found in tea and oriental soup. It makes an excellent complement to any low calorie diet plan or vegetable soup diet. Is winter melon good for you? Eating ash-gourd is one way to slim down to size. How The Winter Melon Diet works is by eating between 300 and 500 grams of winter melon also known as ash gourd you can get the benefits of winter melon. That's the winter melon diet. No need for strict limits on what you can and can't eat, or exercise routines that feel like boot camp. With the diuretic effect you get out of dietary fiber in winter melon, edema leg swelling and constipation is as good as gone. In this diet Slism, we introduce the a diet plan for weight loss eating winter melon fit for low calorie meals, fixing constipation, and overall obesity prevention. The rules to the winter melon diet are simple. All you need to do is eat the minimum amount of winter melon daily and drink winter melon tea to reduce calories in your diet as well as benefiting from nutrition in winter melon. Winter melon is also known as ash gourd or gourd. There are only 16 Calories in Winter Melon per 100g and 392 in a single melon of 2450g in weight. Its noteworthy nutrients are vitamin C and molybdenum. The calories in 250g of winter melon such as that used to make Stewed Winter Melon can be burned in 15 minutes of walking. The winter melon diet plan to lose weight comprises of only one rule that is to eat between 300 and 500 grams of winter melon a day. It doesn't involve exercise, strict dietary restrictions, or need to spend too much time counting calories. It has a light taste which makes it a select ingredient to many dishes such as vegetable soup and winter melon tea. Soup made with winter melon is said to go good with miso. When cooked with chicken, pork, or fish it is delicious. For best results in the winter melon diet making use of broth used to make winter melon soup is highly recommended. The winter melon diet is not limited to eating the fruit of winter melon. There is also a lot to look forward to by making use of the leaves and seeds of winter melon in tea. Winter melon tea is a good example of winter melon nutrition put to work in your diet. For best results drinking while eating winter melon is recommended. No weight loss diet plan for losing weight is without benefits to make the method work. The winter melon diet is no different. You can expect to have the diuretic effect come in handy when you are trying to detox your body. Combining essential nutrition such as vitamin C and dietary fiber you can remedy constipation while treating your skin. Winter melon saponins kick your diet into second gear giving you the right stuff to prevent obesity not to the added plus of being so low in calories. Winter melon is a food well known for the natural diuretic effect it has on the body as a Potassium Rich Food. The reason for this is that it contains potassium that helps flush out sugars and bodily waist through your urinary tract. When dealing with water retention potassium serves to eliminate salt content in blood helping to restore stability to your body. Being both high in vitamin C and dietary fiber is one characteristic that makes the winter melon diet so attractive. In addition to cleaning up your bowels, dietary fiber increases the nutrient absorption of vitamin C in your diet, just what you need stop being constipated while getting better looking skin. Winter melon contains saponins beneficial to your diet. Saponin has the power to block fat as well as impede spikes in your sugar level. These benefits have been said to be helpful in the prevention of obesity and recovery from obesity. 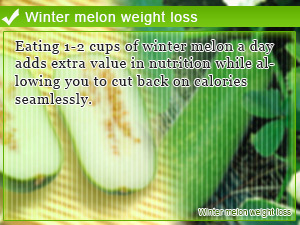 One of the reasons why everyone is talking about the winter melon diet is because it is so low in calories. With only 16 calories in every 100 grams, there is no comparison except in the case of Low Calorie Shirataki Noodles. By eating between 300 and 500 grams of winter melon per day, you only consume an extra 48 to 80 calories. Just because it is low in calories doesn't mean you can eat a whole truck of it. Overeating on a winter melon diet is more common than you think. Size matters, when you are cooking. Due to their size, winter melon is said to be difficult to cook in small portions. Lastly, special precaution needs to be made with ripe winter melon to prevent it from going bad. Eating Too Winter Melon Will Make You Cold - Avoid Overeating! Winter melon is over 90 percent water. Eating too much winter melon can result in chills common in women battling problems associated with poor circulation. A winter melon on average weighs between 4 and 5 kilograms. That's 10 pound! Imagine trying to cook a 10 pound winter melon for dinner. Well, at least we know what's being served as leftovers. Ripe Winter Melon Goes Bad Before You Know It! Winter melon is a summer vegetable. Stored in a cool dark place, they are said to last till winter. However, after cutting up into pieces, it is said to go bad fast. Preserving leftover winter melon in the freezer is recommended. Eating 1-2 cups of winter melon a day adds extra value in nutrition while allowing you to cut back on calories seamlessly. 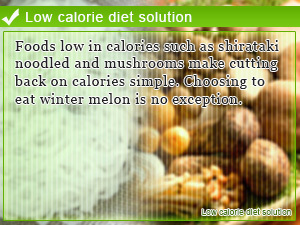 Foods low in calories such as shirataki noodled and mushrooms make cutting back on calories simple. Choosing to eat winter melon is no exception. 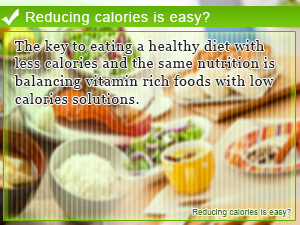 The key to eating a healthy diet with less calories and the same nutrition is balancing vitamin rich foods with low calories solutions.